Many of London’s Indian communities lie on the outskirts (particularly Southall near Heathrow Airport), but we found it very easy to find authentic Indian cuisine in Central London. We regularly eat Indian food in California, and I spent a month in India during a college summer, so we thought we knew what to expect—but our expectations were surpassed in both of our Indian dinners in every way (and at a fairly reasonable value given London’s high dining prices). We were so excited about Indian food in London (or maybe it was we were so not excited about British food), that we ate Indian food our first night. 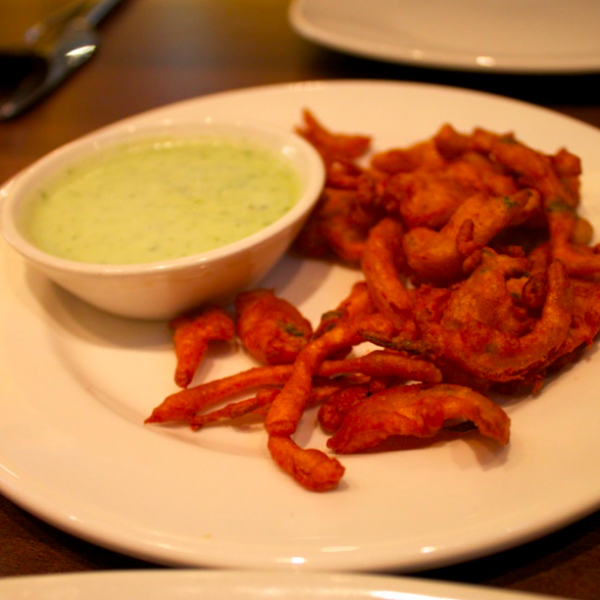 After doing some background online research from our hotel, we decided to try Punjab near Covent Garden. Although the restaurant was extremely crowded upon arrival, the wait staff found us a table for 2 very quickly. Punjab specializes in North Indian food (which is mainly what is found in the United States). Their menu offered some of our favorites (all of which we ordered): samosas, chicken tikka masala, saag panner, and naan. Ironically, we enjoyed the food with a California Chardonnay, which paired excellently. Despite being in Central London, many of the other clientele were British Indians (which is a good sign). Our bill for £47 was probably one of our lowest in London. Idl i: A pillow of rice and lentils, often served with chutney (coconut and vegetable at the Woodlands). 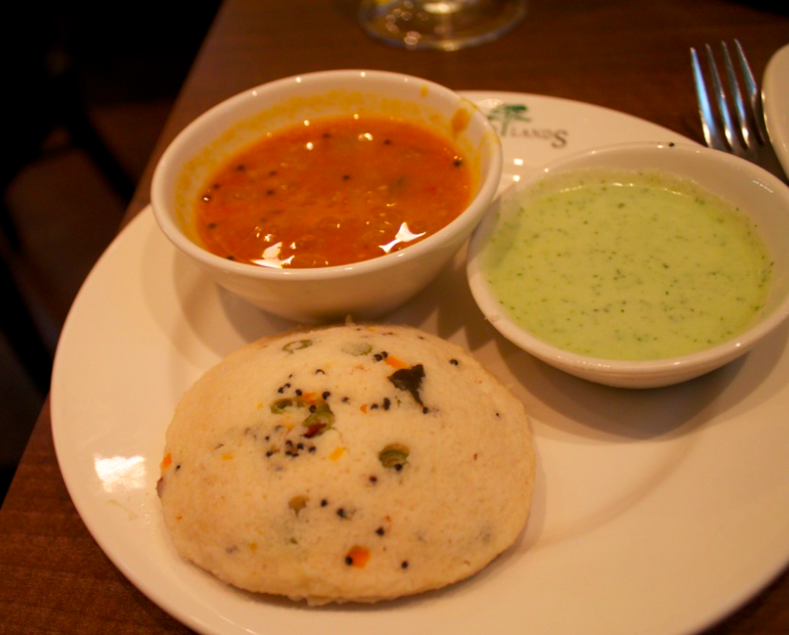 In India, idli is actually often served as a breakfast dish. 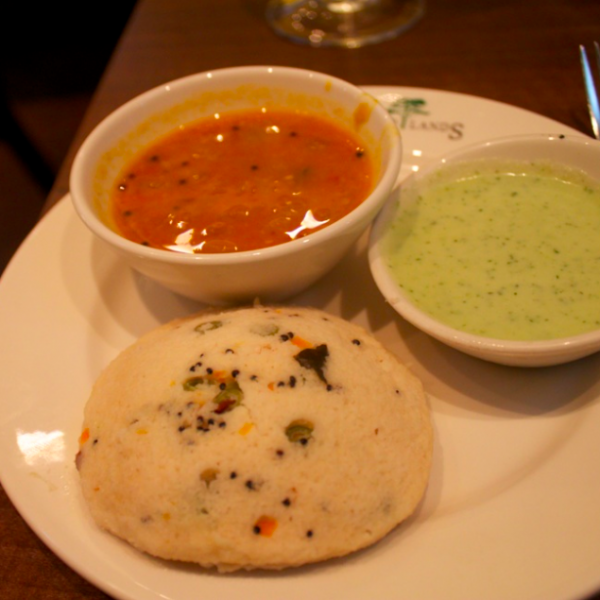 It is a very traditional South Indian dish and can probably be found in many different restaurants in London. Our idli was served as an appetizer, before the actual thali platter. We found it extremely satisfying! 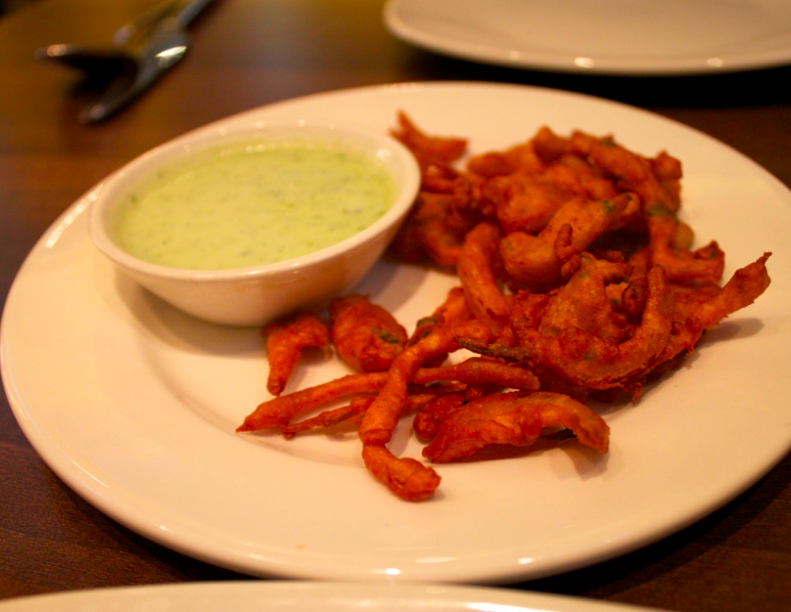 Bhajjia: Fried onion fritters, also served with chutney (coconut in our case). Bhajjia can also be made with carrots, peppers, and potatoes. We found that it was a decent substitute for the samosas we usually order at North Indian restaurants. The portion size at the Woodlands is just perfect, and the fried onions paired very well with our white wine. Dosa: A crepe made with a batter of lentils and rice (again served with a selection of chutneys). It’s hard to find anything tastier than good dosa when cooked perfectly. In America, probably the closest thing you can find to it is a pancake. 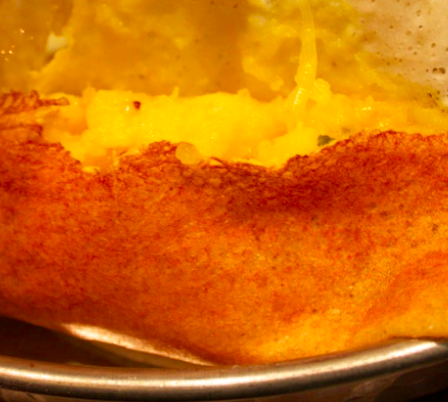 It is common to find a variety of dosa on a menu. Although we had potato dosa with our thali, Woodlands also offered spicy, mushroom, and onion. 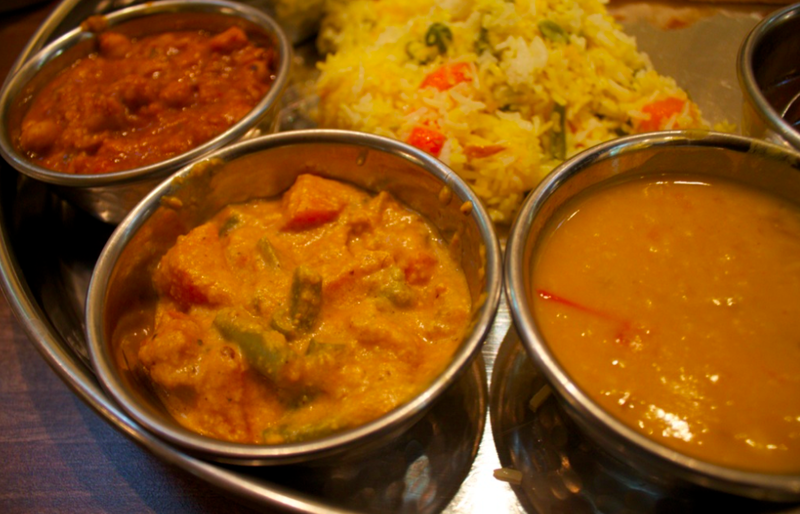 Korma: When the thali tray comes out, one of the best things to do is mix up the various curries with the rice. 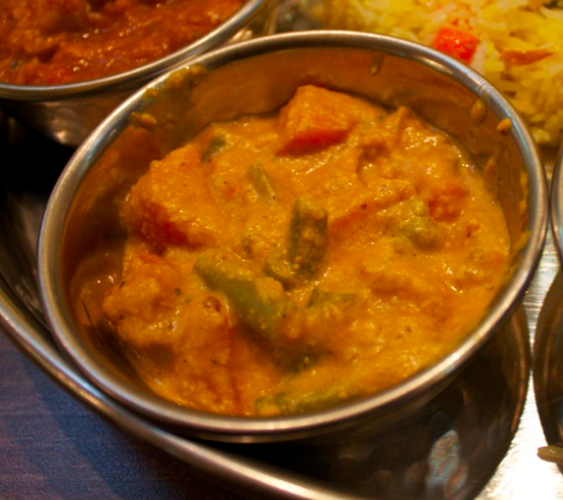 One of our favorites to mix was korma, a mix of vegetables cooked in a creamy yogurt nut sauce. The korma at Woodlands was made with a cashew sauce and included green beans, sweet potatoes, and peas. We enjoyed it all, except for the dessert, which was a little exotic, and again selected a white wine, which paired excellently with the food. We found ourselves sitting next to many locals and, although our bill was slightly higher, it was reasonable for London. All in all, the dinner was a very unique experience. Our two Indian meals ended up being a trip highlight, and we look forward to finding delicious Indian food next time we visit London. Given the limited allure of British food, visitors should certainly try and include at least one Indian meal on their London itinerary. This entry was posted in Food, Travel and tagged Europe, food, London, London 2012 Trip, UK by Ryan. Bookmark the permalink.